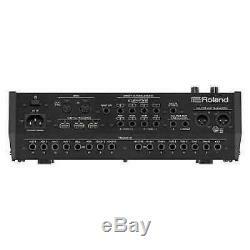 Roland TD-50 V-Drums Sound Module from japan ems. Flagship model of V drum sound source. By reproducing the mechanism of sound of the drum sound by our own new "Prismatic Sound Modeling" technology, we realized a drum sound with rich expressive power of vibrant reverberation. Achieve your own sound with the user sample function that captures audio data and can use effects as well as the built-in sounds, and the layer function that overlays the added audio data with the built-in sound. It is possible to make a total sound with the drummer's own hand such as multi effect, comp / EQ, ambience etc, including the V edit function that can customize the structure of the drum such as the depth of the shell. Corresponds to the connection of digital pads equipped with newly developed multi-element sensors that maximize the potential of modeling sound sources. 10-in / 4-in USB audio and MIDI input / output function, realizing multitrack recording on PC with one cable. 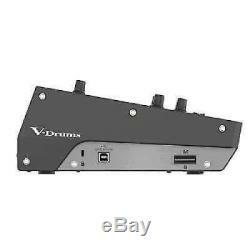 It corresponds to audio file (WAV / MP3) playback and data backup by SD card. Flagship model of the V drum sound source which further raised the expressive power and function desired by the drummer. The TD - 50 thoroughly pursued expressive expressions and performance feelings unique to drums, such as vivid sounds and direct responses, and further refined. With the new sound engine with its own new "Prismatic Sound Modeling" technology, it reflects the behavior of instruments by every playing style in the sound. It makes possible the expression of drummer as expected. In addition, it corresponds to newly developed pads equipped with multi-element sensors, and by using them in combination, it is possible to maximize expressive power of sound source. Combining the expertise that has been able to respond to various professional demands such as universal sound customization, rich output terminal and multitrack recording with one USB cable, and the needs of all drummers as the highest peak V drum sound source I will meet. Drum kit number = 100 (Preset: 50). Tone color number = 400 or more. Connection terminal = TRIGGER IN terminal × 14: TRS standard type (exclusive use with digital connection compatible pad), DIGITAL TRIGGER IN terminal × 3: USB A type, MASTER OUT (UNBALANCED) terminal (L / MONO, R): Standard type, MASTER OUT (BALANCED) terminal (L, R): XLR type (balance), DIRECT OUT (BALANCED) terminal × 8: TRS standard type (balance), PHONES terminal × 2: stereo standard type, stereo mini type, MIX USB terminal (USB Hi-Speed AUDIO / MIDI compatible), FOOT SW terminal: TRS standard type , AC IN terminal. Power consumption = 30 W. We can accept retune within 30 days after you receive it. No retunes on products that show any evidences of use. A specialty shop offering a wide variety of carefully selected Japanese brand items. Even if you think to yourself, But the item I want is only available in Japan. , make sure to consult with us before giving up hope. We will look for and suggest the best products on your behalf. International Buyers - Please Note. 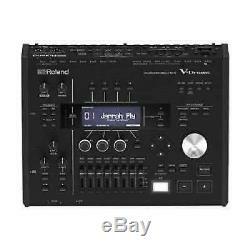 The item "Roland TD-50 V-Drums Sound Module from japan ems" is in sale since Wednesday, May 2, 2018. 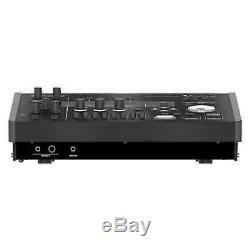 This item is in the category "Musical Instruments & Gear\Percussion\Drums\Electronic Drums". The seller is "futurebank" and is located in tokyo.